We traveled to Chiang Mai by air, flying Nok Air from Don Mueang Airport. Until September 2005, Don Mueang was Bangkok’s sole airport. 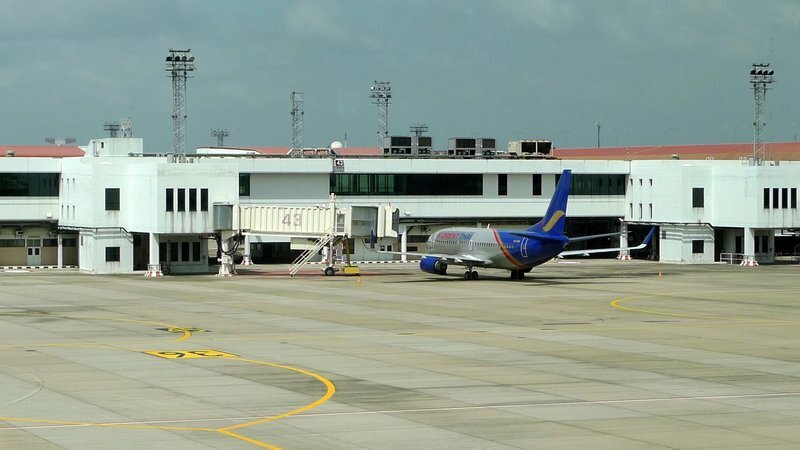 After the opening of Suvarnabhumi International Airport, operations at Don Mueang are now limited to three domestic carriers and certain military, diplomatic, private, and charter flights. Everything else operates from Suvarnabhumi. Just outside the security area there is a great deal of empty space. 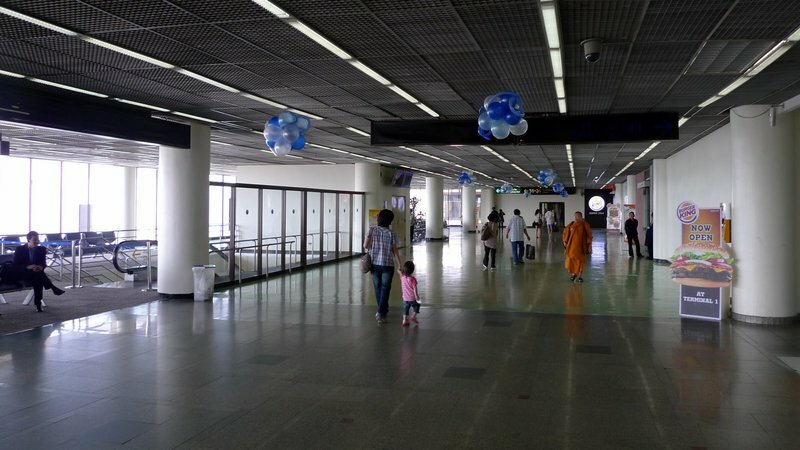 Three days before our departure, Airports of Thailand, the publicly-traded company that operates Don Mueang, Suvarnabhumi, and four other Thai airports, switched operations at Don Mueang from the domestic terminal to international terminal #1. The reasoning for this seems a bit unclear, as AOT’s own announcement projected traffic at Don Mueang to reach just under 4 million passengers this year, well below the old domestic terminal’s capacity of 11 million. 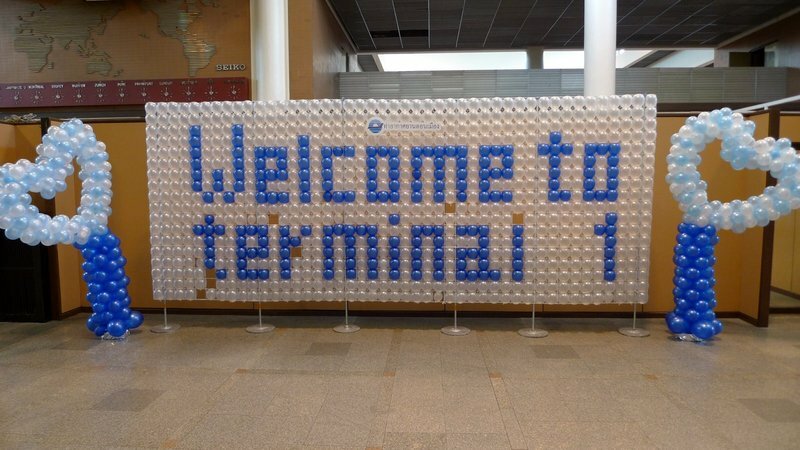 Terminal 1 has a stated capacity of 16 million. Scattered passengers inside the secured area with a sign for the sole restaurant: Burger King. The physical space has increased from just under 42,000 square meters to almost 60,000. While AOT claims to have spent a significant sum preparing for the reopening of Terminal 1, the interior remains very shabby and quite forlorn. Instead of operating from one pier, there are now two piers in operation, resulting in a very long walk between gate areas. Thankfully, most passengers at this airport are not connecting but are instead ending their flights here in Bangkok. 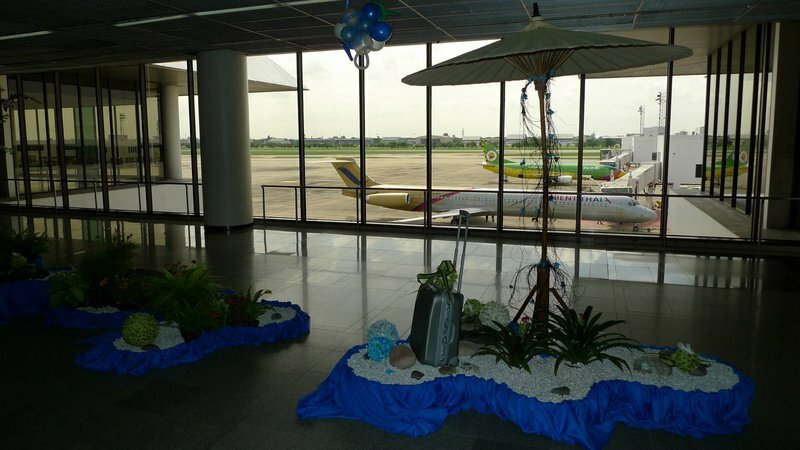 The two major airlines at Don Mueang – Orient Thai and Nok Air – are visible in the background. The budget for decorations must have been extraordinarily low as AOT staff have hung balloons and made this “getaway island” display that looks borrowed from a secondary school prom. The one thing that seems to be working well, perhaps even too well, is the air conditioning. The gate areas were chilly. 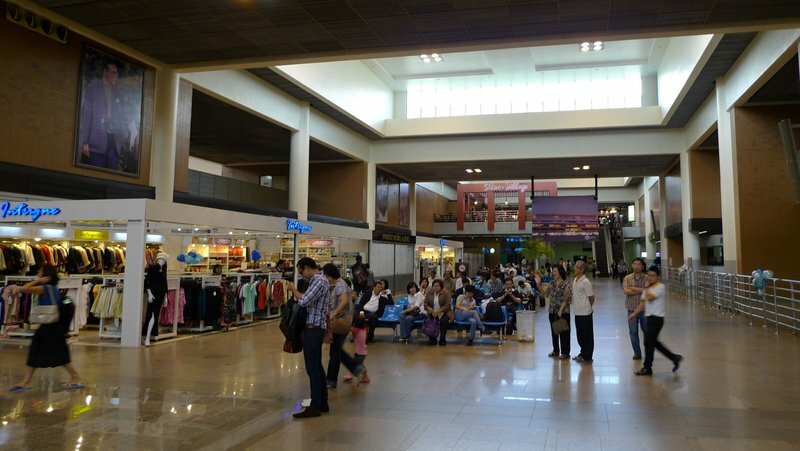 Shopping facilities inside the secured area are limited with only one restaurant and, in the former THAI Airways Royal Orchid Lounge, a massage parlor. Orient Thai Boeing 737 waiting to enter service. Orient Thai, formerly known as “One Two Go”, seems to have acquired a Boeing 737-400 for its fleet. Sure enough, three days later I read in the paper that they are phasing out their MD-80s in favor of the 737s, which despite having fuel-saving winglets installed are twenty-year-old technology. Besides Orient Thai and Nok Air, the other airline operating from Don Mueang is Solar Air, a small prop-jet operation. Nok Air Boeing 737 pulls into gate 35 at Don Mueang. 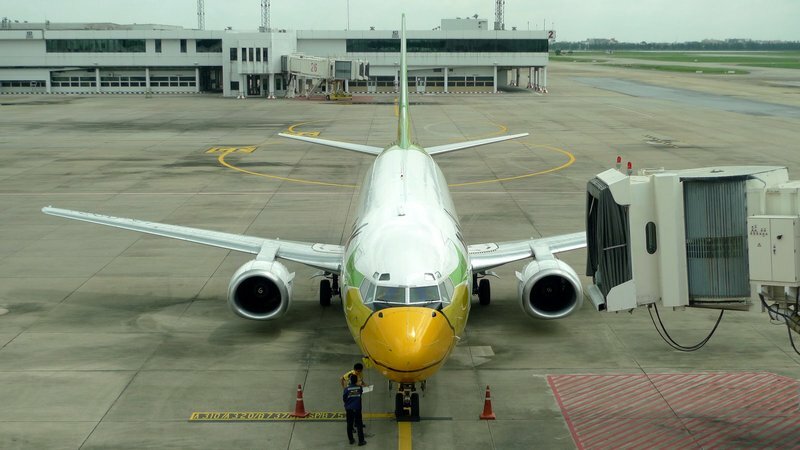 Our jet, a Nok Air Boeing 737-400, pulls into the gate. The airline recently announced plans to introduce an updated version of these jets, the -800 model, this year. “Nok” means “bird” in Thai, so each of the planes is painted to look like a bird with a playful beak painted on the nose. THAI Airways International owns 39% of Nok Air and, ostensibly, Nok Air is the lower cost feeder carrier for THAI, taking over most of the larger carrier’s domestic routes. 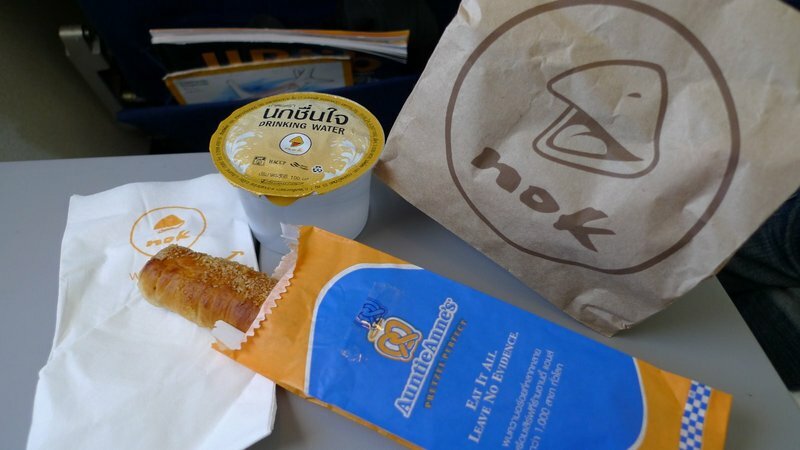 There has been, however, considerable friction between the two airlines and THAI has indicated plans to create its own low-cost operation separate from Nok. When’s the last time you received a free snack on a domestic US airline flight? Nok Air is actually a decent enough airline. It features assigned seats, free checked baggage, and snacks on the flights, things the largest domestic airline, Thai Air Asia, does not offer. On our flight up to Chiang Mai, we received this Nok Bag with an Auntie Anne’s chocolate pretzel stick and a container of water. On the way back to Bangkok, the Nok Bag contained some coconut cake. Not bad for an hour-long flight! We arrived on Wednesday afternoon in an overcast and slightly drizzly Chiang Mai for four days of relaxation. More about that soon. This entry was posted in Uncategorized and tagged Air, airline, airplane, aviation, Bangkok, Don Mueang, flight, Nok, Thailand by christao408. Bookmark the permalink. Interesting entry, seeing Don Meang airport again, where I used to fly often years ago. The decor is cheesy too, with tiny balloons, and minimal signage. Are the Thai Airway lounges still in operation? @CurryPuffy – Nope, the TG Lounges are not in operation at Don Mueng because TG moved all their operations over to Suvanrabhumi about a year ago. @yang1815 – I assume you mean the Nok Air plane? I think the new Orient Thai color scheme is terrible. @christao408 – Yes sir the Nok one. I am sure they have plans to add more restaurants and shops to this vast place. It might take some time, but I think it will be done. At least I hope so. wow, what a sad, empty-looking airport. i take it that the place was not very crowded? I call the one in Philadelphia the “Airport from Hell”…altho’ it has plenty of restaurants. I DO like the one in Indianapolis which always reminds me of one of my university art professor’s mantra: “Form follows function.” It is very functional. It’s odd seeing an empty airport. I have this urge to pop all those balloons.